Kidneys are primarily responsible for maintaining normal acid-base homeostasis, by excretion of titrable acid. Conditions with impaired kidney function, including chronic kidney disease (CKD), are, therefore, associated with the development of metabolic acidosis, which increases in severity with progressive loss of renal function. Significant metabolic acidosis is a common feature of advanced CKD and correction of the same is one of the therapeutic targets in the care of patients with CKD. Persistent metabolic acidosis is known to have adverse consequences in patients with CKD including protein-energy wasting, inflammation, bone disease, and disturbance in endocrine function.,, Similar consequences may be expected in patients with end-stage renal disease (ESRD) on regular dialysis as well. The two most commonly employed forms of renal replacement therapy (RRT) – hemodialysis (HD) and peritoneal dialysis (PD) – both use a base in the dialysate to correct metabolic acidosis by replenishing serum bicarbonate. PD is a continuous modality of RRT and hence considered more physiological, whereas HD is an intermittent therapy where the metabolic parameters are not static. Therefore, it is expected that PD may provide more consistent serum bicarbonate levels compared to patients on HD, in whom the serum bicarbonate levels are expected to fluctuate, depending on the day it is tested, in relation to the patient's HD schedule. The effect of metabolic acidosis on clinical outcomes may differ between the two dialysis modalities. The “adequacy” of dialysis dose is an important consideration in delivering dialysis treatment and correction of metabolic derangements is an indirect way of assessing dialysis adequacy. The KDOQI guidelines recommend serum bicarbonate levels ≥22 mEq/L in patients on dialysis., However, the dose of dialysis prescribed is not uniform across the globe and is often guided by availability of resources. The standard dialysis regimens followed in the affluent population are three sessions of HD a week and four exchanges of PD per day. The practice in resource poor settings, like in many centers in India, is to do twice a week HD and three exchanges of PD in a day, due to financial constraints. There is no literature available on the serum bicarbonate levels in patients undergoing twice a week HD and doing three exchanges of PD in a day. It is possible that the relatively lower dose of dialysis offered to our patients results in incomplete correction of metabolic acidosis, putting them at the risk of long-term consequences of persistent metabolic acidosis. We planned to study the serum bicarbonate levels in dialysis patients at our center. The study protocol was approved by our Institute's Undergraduate Research Monitoring Committee and the Institute Ethics Committee. The study was carried out from June 1, 2017, to July 30, 2017. The primary objective was to study the serum bicarbonate levels in patients undergoing regular HD and PD at our center. The secondary objective was to study the extent of change in serum bicarbonate levels in patients before and after HD sessions. All patients with age >18 years and on regular HD or continuous ambulatory PD from the center were screened for recruitment into the study. Consent was taken from patients who were eligible to be recruited in the study. Pre- and postdialysis blood samples were collected from the dialysis circuit following the standard procedure prescribed for the same. All relevant information related to the patients and the HD treatment was collected using a predefined case report form. Any intercurrent acute illness at the time of the study. All patients found eligible and willing to give consent were recruited in the study. All relevant information related to the patients and the dialysis treatment was collected using a predefined case report form. Blood samples of 0.5 ml were collected for the study purpose in the outpatient department (OPD) for estimation of serum bicarbonate levels. The serum bicarbonate levels were measured immediately after taking sample using the ABG machine available in the Department of Nephrology. The “standard” bicarbonate value from the ABG report was used for all analyses. The collected data were compiled in a MS Excel master chart. The values of serum bicarbonate were summarized as a mean and standard deviation. The extent of change of serum bicarbonate levels before and after HD sessions in patients undergoing HD was compared by paired t- test. We recruited 141 subjects with ESRD on regular dialysis treatment with Department of Nephrology, between June 1 and July 31, 2017, 100 HD and 41 PD patients. The demographic characteristics of the patients are summarized in [Table 1] and [Table 3]. All patients were on dialysis for >3 months and there were no treatment defaulters. Patients who were nonvegetarians reported taking at least one egg a day and at least two servings of chicken or fish every week. Most of the study participants had preserved residual renal function with 61% (n = 87) having urine output >100 ml/day. Nearly 34.5% had urine output between 100 and 500 ml and 27.2% had urine output >500 ml/day. Baseline characteristics are summarized in [Table 1]. The dialysate flow was 500 ml/min for all subjects and duration of dialysis treatment was 4 h. Bicarbonate-based buffer is used in our unit and bicarbonate level measured in the dialysate bath was 34 mEq/L. Most of our patients were anemic, despite being on treatment with erythropoietin [Table 1], hypoalbuminemia was common [Table 1] and 60% had urine output >100 ml/day, indicating significant residual renal function. The mean predialysis serum bicarbonate level was 19.95 (±5.4) mEq/L and the mean postdialysis serum bicarbonate level was 23.45 (±5.4) mEq/L, which was significantly higher (p < 0.05) than the predialysis levels [Figure 1]. Only 27 patients had predialysis bicarbonate level of 22 mEq/L or more, 73% had predialysis levels <22 mEq/L. Forty-one subjects (41%) continued to have serum bicarbonate level <22 mEq/L at the end of HD session and 59 subjects (59%) had postdialysis serum bicarbonate level of 22 mEq/L or more. Among subjects on HD, 66% had acidemia (pH <7.35 and serum bicarbonate <22 mEq/L), 20% had compensated metabolic acidosis, and 14% had no evidence of metabolic acidosis when tested before a HD session. When tested postdialysis, 25% continued to have acidemia, 32% had compensated metabolic acidosis, and 42% had no evidence of metabolic acidosis. We compared patients on thrice a week HD to twice a week HD schedule with regard to their predialysis levels of serum bicarbonate. 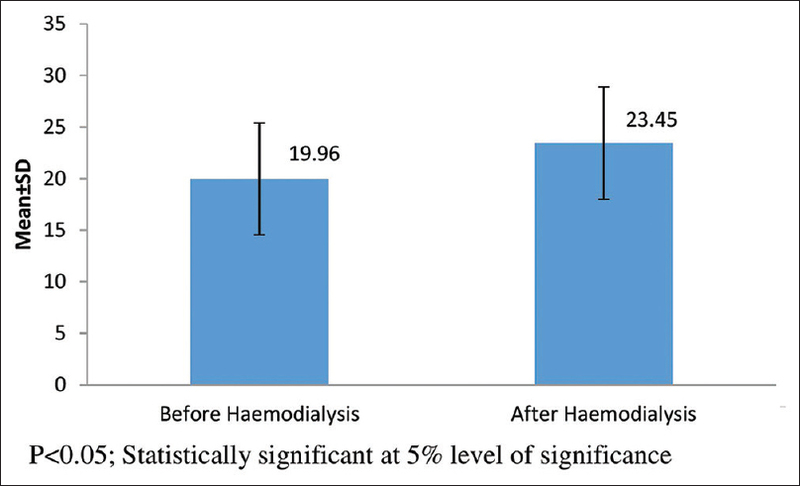 Almost 62% of patients on thrice a week HD had predialysis serum bicarbonate levels <22 mEq/L compared to 80% among patients on twice a week dialysis schedule. The mean blood flow rate during HD sessions in patients who had predialysis bicarbonate levels <22 mEq/L was 219 ml/min (vs. 215 ml/min in those who had serum bicarbonate ≥22 mEq/L). There was no significant difference in the predialysis bicarbonate levels tested on various days of the week in our study population. 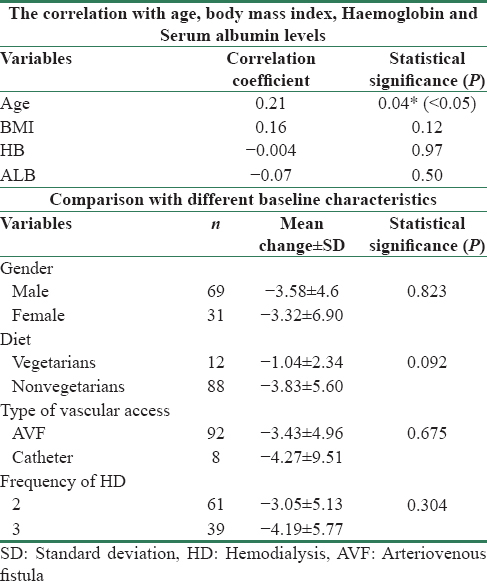 The difference in the change (correction) of level of serum bicarbonate with relation to variables like Gender, vascular access type, dietary habits and dialysis frequency is described in [Table 2]. Except age, which was found to statistically correlate with the change in serum bicarbonate (r = 0.208, p < 0.05), all other factors have no effect on change of serum bicarbonate [Table 2]. During the study period, 59 patients were on follow-up with us and among these, 18 were excluded because they did not meet the recruitment criteria for the study or had discontinued PD during the study period [Figure 2]. Only 41 PD subjects could be recruited during the study period. The subjects used dextrose-based PD solution and none of them were on exchanges with PD fluids based on Icodextrin or amino acid-based solutions. Among 41 subjects on PD, 38 were on three PD exchanges per day and only 3 subjects were doing four exchanges of PD. All the patients were performing CAPD. The serum bicarbonate level was 22 mEq/L or more in 33 subjects and only 5 subjects had a level <22 mEq/L. Nearly 78% of patients on PD had no evidence of metabolic acidosis (pH >7.35 and serum bicarbonate ≥22 mEq/L), 14% had compensated metabolic acidosis, and 8% had acidemia (pH <7.35 and serum bicarbonate <22 mEq/L). The sociodemographic characteristics of the patients on PD are given in [Table 3]. The mean serum bicarbonate level among male and female patients was 23.57 (±2.26) and 25.77 (±3.77), and it was observed that the level of serum bicarbonate was significantly higher in females (p < 0.05) compared to males. The serum bicarbonate level was independent (p > 0.05) of diet and number of PD exchanges. Age was found to statistically correlate with the change in serum bicarbonate (r = −0.36, p < 0.05) and other variables such as BMI, hemoglobin, and albumin were not found to be significantly correlating (p > 0.05) with serum bicarbonate. The mean predialysis serum bicarbonate in HD population was 19.96 mEq/L, and it was significantly lower (p < 0.05) than mean serum bicarbonate in PD population (24.75 mEq/L). The proportion of patients with low level of serum bicarbonate was significantly higher (p < 0.05) in HD patients than PD, with serum bicarbonate levels <22 mEq/L observed in 73% HD patients compared to only 12% in PD patients [Table 4]. Our study showed that significant metabolic acidosis is present in 73% of patients on HD, with the acidosis remaining uncorrected even in the immediate postdialysis period in a significant number of patients. In comparison, PD provided better correction of metabolic acidosis with only 12% of patients having metabolic acidosis. Persistent, metabolic acidosis is undesirable in patients who are on dialysis because of the various adverse consequences of acidosis. Metabolic acidosis is known to be associated with malnutrition, inflammation, muscle wasting, and increased risk of mortality in dialysis patients and patients with CKD. It is recommended that the predialysis serum bicarbonate level should be 22 mEq/L or more in HD patients. The prevalence of metabolic acidosis in our PD population was similar to that reported from elsewhere However, it is a cause of concern that three-fourth of our HD patients continued to have metabolic acidosis when checked predialysis, and in 41% subjects, the acidosis persisted in the immediate postdialysis period also. Various factors may be contributing to this observation. 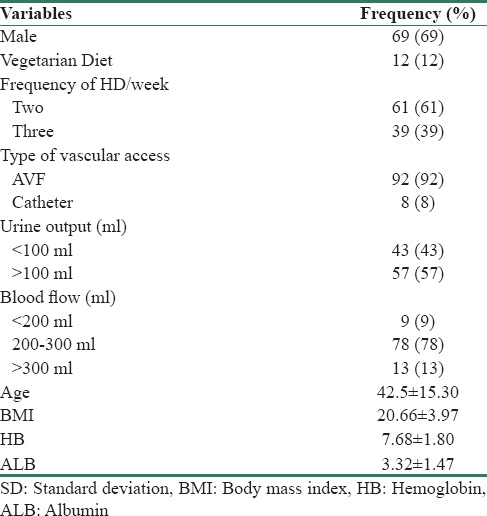 The mean blood flow rate during HD in patients whose predialysis bicarbonate levels was <22 mEq/L was about 220 ml/min, and this could be compromising dialysis dose delivered. We used a uniform dialysate bicarbonate level of about 34 mEq/L for all patients at our unit. It is known that dialysate bicarbonate levels influence predialysis bicarbonate levels. Vashistha et al. reported that, with a dialysate bicarbonate concentration of 30 to <33 mEq/L, 53% patients had predialysis bicarbonate levels <22 mEq/L and with dialysate bicarbonate concentration of 39–40 mEq/L, still 36% of patients had serum bicarbonate <22 mEq/L. It has been shown that high intake of protein, which contributes to the acid load, is associated with worse metabolic acidosis in patients on dialysis. Ninety percent of our study subjects reported regular intake of meat and egg in significant quantities. All these factors, coupled with the fact that 61% of our subjects were on a twice a week HD schedule, should have contributed to the high proportion of persistent metabolic acidosis in our patients despite regular HD treatment. It is also evident that the twice a week HD schedule (vs. 3 times a week schedule) is not the only factor responsible for the persistent metabolic acidosis in our subjects, from the fact that 61% of our subjects who were on a thrice a week schedule also had predialysis serum bicarbonate levels <22 mEq/L. Factors previously reported to be associated with low predialysis bicarbonate levels in other studies, did not correlate with serum bicarbonate levels in our patients. This is most likely the result of low sample size in our study, which was not powered enough to demonstrate such correlation. It is interesting to note that persistent metabolic acidosis was significantly less common in PD patients. However, it should be emphasized that the study was not designed to bring out the differences between PD and HD population and the two populations had significant differences. The patients on PD were relatively younger, were predominantly female, had better hemoglobin levels, and a higher proportion of patients had preserved residual renal function, compared to patients on HD. We observed that the serum bicarbonate levels were significantly better in females compared to males and in older subjects compared to younger. The most likely explanation for this is the higher lean body mass in younger subjects and in males, contributing to higher generation of H+ and resulting in lower serum bicarbonate levels because the PD prescription (dwell volume and number of exchanges) was practically the same for all subjects irrespective of patient characteristics. However, we made no attempt to study the body composition or the lean body mass in our subjects. Our findings highlight the urgent need for modifying HD prescription, tailoring to better correction of metabolic acidosis in our patients. Prescribing higher blood flow rates during dialysis and titrating the dialysate bicarbonate concentration with individualization of dialysis bicarbonate prescription along with monitoring of serum bicarbonate concentration may be helpful. Increasing the frequency of dialysis to thrice a week in majority of patients is one of the option. Pre-dialysis serum bicarbonate levels may not be routinely monitored in patients on dialysis in most of the dialysis units. Majority of the literature available on metabolic acidosis on dialysis patients are from more affluent countries where the prescription of HD and PD are more liberal. Ours is the first study to report the burden of metabolic acidosis in patients on a twice a week HD schedule and metabolic acidosis in a PD patient population in India, to the best of our knowledge. The main drawback of our study is that it is a single-center study and hence could enroll only a limited number of patients. As discussed above, the patients on HD and PD were not necessarily comparable, and hence it is not advisable to compare the effectiveness of correction of metabolic acidosis of the two different modalities based on the findings from this study. A significant proportion of patients with ESRD on regular HD continue to have uncorrected metabolic acidosis. Compared to HD, the proportion of patients having persistent metabolic acidosis was significantly lower in PD. Serum bicarbonate levels need to be periodically checked in patients on dialysis to identify those with persistent acidosis, which may necessitate therapeutic interventions, including modification of dialysis prescription. The authors wish to thank Mr. Ebin Thomas, Clinical Manager, JIPMER outpatient HD Centre for assistance in recruiting patients in the study. The bicarbonate level testing was done in the Department of Nephrology, JIPMER, the expenses for which was borne by JIPMER, Puducherry. Chang TI, Oh HJ, Kang EW, Yoo TH, Shin SK, Kang SW, et al. A low serum bicarbonate concentration as a risk factor for mortality in peritoneal dialysis patients. PLoS One 2013;8:e82912. Slinin Y, Guo H, Li S, Liu J, Ensrud K, Gilbertson DT, et al. 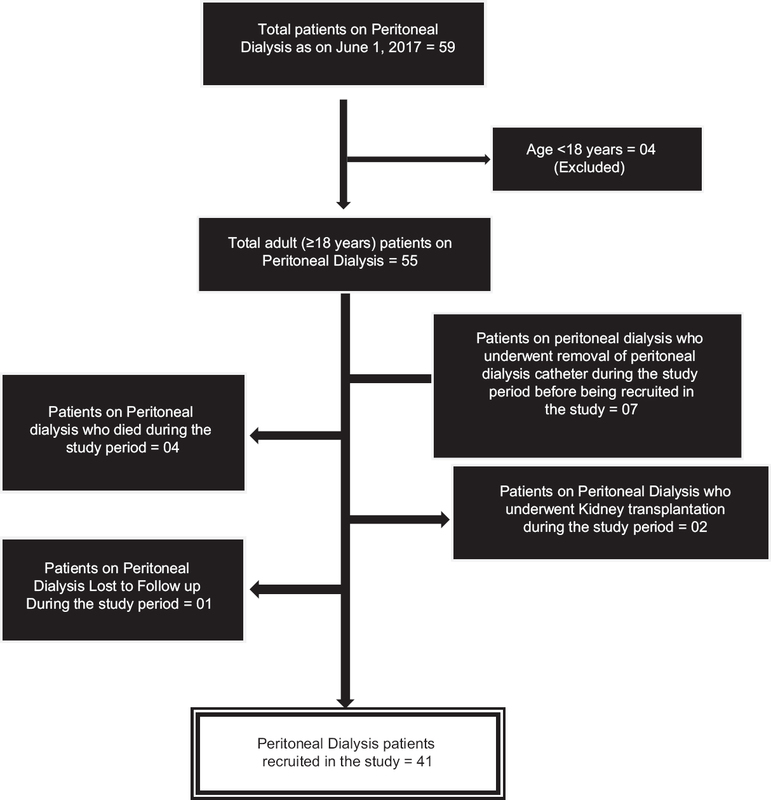 Association of provider-patient visit frequency and patient outcomes on hemodialysis. J Am Soc Nephrol 2012;23:1560-7. 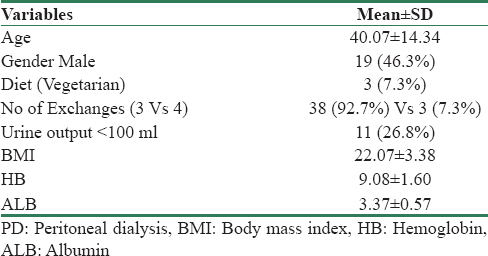 Vashistha T, Kalantar-Zadeh K, Molnar MZ, Torlén K, Mehrotra R. Dialysis modality and correction of uremic metabolic acidosis: Relationship with all-cause and cause-specific mortality. Clin J Am Soc Nephrol 2013;8:254-64. Fleming GM. Renal replacement therapy review: Past, present and future. Organogenesis 2011;7:2-12. Chen W, Abramowitz MK. Treatment of metabolic acidosis in patients with CKD. Am J Kidney Dis 2014;63:311-7. Kim HJ, Han SW. Metabolic acidosis in maintenance hemodialysis patients: Clinical impact and intervention. Electrolyte Blood Press 2007;5:42-6. Jeloka TK, Upase S, Chitikeshi S. Monthly cost of three exchanges a day peritoneal dialysis is same as of thrice a week hemodialysis in self-paying Indian patients. Indian J Nephrol 2012;22:39-41.